I never really understood architecture photography. I figured that the artist was the one who had created the work, and the photographer was merely documenting someone else’s masterpiece. But then Julius Shulman’s portfolio changed my mind, showing me how a photographer’s perspective can actually influence the art and medium itself. 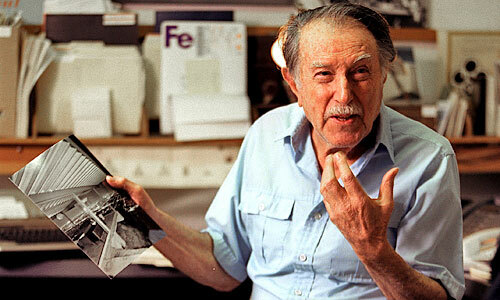 Modern architecture photographer Julius Shulman died today at the age of 98. This guy led an impressive career, chronicling California contemporary home design in a way that impacted architecture forever. Read more about Shulman’s life and work in theLA Times. Eric Bricker recently completed a documentary on Shulman, narrated by Dustin Hoffman, that is set to screen this August. You can learn more aboutVISUAL ACOUSTICShere.